I’m starting to understand why people say long trips such as mine are as much or more a mental challenge than a physical one. Of course I thought I knew that before I began but I can feel the emotions now. I’ve had days where the cycling has being boring. I find cycling along roads where I can’t stop with little in the way of changing scenery somewhat tedious. To pass the time, my mind normally wanders to food. I try and invent new one pan dishes. For someone who was very fastidious about their diet and ate where possible a whole food diet, travelling on the road with one pan and unknown food outlets can be a tortuous process. I kid myself and don’t look at the ingredients sometimes. It took ages for me to notice my stock dinner of tinned mackerel in a tomato based sauce with pasta and veggies was loaded with MSG. That is now off the menu. My latest incarnation is using olive oil as a sauce and adding cheese with rice and veggies with some spice thrown in for taste. I always buy cooked meat when I use that for protein as it’s very difficult to get enough raw meat for one meal and secondly because I’m worried about the hygiene in preparing it. If you want to give it a go, try the following. Go to a supermarket (preferably one you have never been in before), buy enough food for one meal only as you can’t refrigerate anything left but you need to be able to carry it in two hands. Leave in a bag somewhere warm for a few hours. When ready to cook, go outside. Doesn’t matter if it is raining. Improvise. Take your one pan, 2 litres in size, one gas burner and no more than 1 litre of water. Remember to save a bit of the water to wash the pan with afterwards. Then send me the recipe! The biggest mental challenge is easily finding somewhere to sleep each night. I am choosing (yes it is a choice) to wild camp as much as possible. That means what it says on the tin, you sleep in the wild, or outdoors somewhere, in my tent or in the bivvy bag, just not anywhere that charges money for it. Over the long run, this saves a great deal of money as it’s about 60% of what I spend on a day I stay in a campsite. Hence I try and do it as much as possible. However it obviously comes at a cost and that is paid in stress. It takes practise and experience to work out where people aren’t going to find you. The best looking sites always seem to be the worst ideas when someone appears from nowhere. I just move on then and keep looking. I had a good run in Germany, didn’t find it too tricky and could put the tent up every time, good job as it rained at night a fair bit. Apart from the one time when i thought I was out of ideas and decided against my better judgement to put the tent up in the middle of a shooting range in a wood. I was discovered by a game warden who said it wasn’t a good idea but suggested somewhere else to go! Whilst I’ve been in France it has been more populated on the route I’ve taken and that always makes it harder. The last two have been particular stressful. The first occasion I found an abandoned lock keepers house with a shed out the back with no door on. It was next to a road but not near any buildings so decided to use just the bivvy bag and hunker down in the shed for the night. First time I had had a roof over my head whilst doing it. However in the middle of the night I awoke to voices and torch lights, I think I let out a deep moan as opposed to a scream and whoever it was sounded distinctly more frightened than me and I heard them leg it back over the lock, get into a car and wheel spin away. Needless to say I didn’t sleep much more that night, lying there wishing for the dawn, the safety of sunlight and a new day. Two nights later I had a different problem, I just couldn’t find anywhere I thought was suitable, most likely put off by the recent experience I was looking for a perfect spot, which of course you never find. I tried what looked like a promising turning from a car park off the road into some woods, only to be followed by some guy in a van. I had stopped, surveying a spot, when he turns up, gets out and makes small talk (in French). Something wasn’t right, he sounded nervous, I realised he was asking if I was staying here the night and turning to see the sun sinking to the horizon I said no, and got moving. I think I might have inadvertently wandered into a nocturnal meeting spot for people that like hanging around in car parks…. The problem now was I was fast running out of daylight, I had done too many miles, I was tired, I just wanted somewhere to sleep. Luckily I found another wood down the road, with just a track running through it, so I hotfooted it through the bushes and trees a good 100 metres or so from the path and got out the bivvy bag. There was no space to put the tent (it’s the photo at the top of the page) and I was out of daylight. I went to sleep with the sound of twigs breaking and rustling, what you come to realise are just animals, you can tell by the sound level that they aren’t heavy enough to be human, either that or they are special forces. 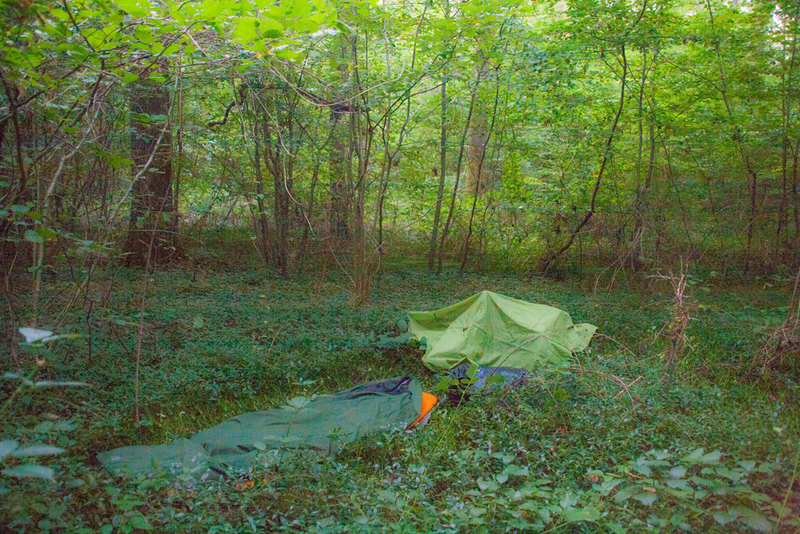 I was only woken during the night by slugs crawling through my hair or trying to get into my warm sleeping bag. This is the mental game I’m playing, the game I invited on myself. To make this trip sustainable, to have a chance of reaching the end (where ever that may be) then it is a price worth paying. The funny thing is, having a bit of ‘luxury’ like I did on my birthday weekend makes it harder. It reminds you of what you can have, of what I am choosing to walk away from. To choose hardship instead of be forced (or born) into it. I’m not complaining, my life is easy, I only worry about food, water & shelter for myself. It is a selfish existence, a meaningless penance but then what isn’t? I wanted a challenge, I’m starting to realise what it actually is. Luckily I became aware of what crap food had done to me after my trip and now live much more ethically/healthily/responsibly…..as far as that is possible in this crazy world. Trying to do that on the road will be a challenge…..good luck. Cheers Shane, this isn’t supposed to be easy though is it? Fair play Iain. I admire how your doing this.